Genevieve was born in Nanterre and moved to Paris, where she dedicated herself to a Christian life. 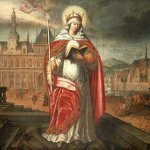 She led a prayer marathon in 451 that has saved Paris by diverting Attila's Huns from the city, as it was said. When Paris was besieged by Childeric I in 464, Genevieve acted as an intermediary between the conqueror and the city. Genevieve collected food and tried to convince Childeric to release his prisoners. Genevieve ministered an abbey, founded by Clovis I. Later Genevieve was buried in that abbey. Many people witnessed numerous miracles near tomb of Genevive and later she was canonized and the church rededicated in her name. In 847 Abbey of St. Genevieve was plundered by the Vikings and totally rebuilt only in 1177. The relics of St. Genevieve were publicly burnt at the Place de Grève in 1793. The relics that survived the fire (shrine and phalanx) are kept in the church Saint-Étienne-du-Mont.